140 actionable quotes on how to easily build your brand and grow your fan base. CUPERTINO, CA (PR Buzz) – April 5, 2017 – – Have you ever thought of writing a book? How did it go, did you finish it, how long did it take? Writing a book is the best way to share ideas and to get others to recognize you as an expert in your space. Who is the expert? The person who wrote the book. The only question is, given your busy life, how can you quickly write yours and make sure others share your thoughts? If you think that writing a book is hard or you don’t know when and how to finish it, then Hey, Did You AHAthat? is the book for you. It helps readers understand the importance of writing a book – a book that reflects their individuality and gives significance and foundation to their ideas – a book that is not only worth sharing, but by its very nature is extremely easy for you and your fan base to share. If you want to read this book and potentially share some of its content, please go to http://aha.pub/AHA. If you know people that are struggling with writing their book, consider sharing "aha.pub/AHA" in their social media status area. “If you have a skill and want to build your brand to serve an audience, you can reach that audience with a book that demonstrates that you're the expert. 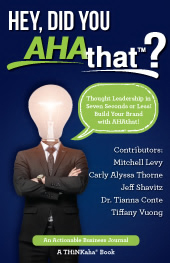 Hey, Did You AHAthat addresses the why would anyone what to write an AHAbook. The cool part is that it's not just me speaking, you can read thoughts from four of our authors. Very powerful!” says Mitchell Levy @happyabout, the AHA Guy at AHAthat (https://ahathat.com). With AHAbooks, you can write about anything, and I think it would be a good experience for anybody to write one. If you want to press the “easy” button on writing a book, then AHAthat (http://AHAthat.com) is the platform for you. Go to http://AHAthat.com/Author to see the 8-step author process that hundreds of authors have used to write their AHAbooks in 8 hours or less.